2+ monsters, except Tokens This card gains these effects based on the number of monsters co-linked to this card. ● 1+: If a monster co-linked to this card battles your opponent’s monster, any battle damage it inflicts to your opponent is doubled. ● 2+: Once per turn: You can target 1 card on the field; banish it. ● 3: Once per turn, when a card or effect is activated (Quick Effect): You can negate the activation, and if you do, banish that card. Tri-Gate Wizard has been hyped since its announcement. Link 3, needing at least two monsters that aren’t tokens, the more co-links with Tri-Gate, the better. Double the battle damage for a co-linked monster is a nice way to add up LP damage, and co-link with just one monster is pretty easy in most decks that Link Summon. A banish once per turn of any card on the field if you can co-link up with two monsters is better, giving you field presence and eliminates resources your opponent has without triggering destruction effects. If you can link up with three monsters you can negate any card effect once per turn and banish that card. This effect is a vast upgrade to the previous effect. A quick effect that can happen during both turns, avoids that destruction-triggering effects, and can banish any card. While you can co-link with a Link monster on your opponents Link monster, you are likely going to get this effect when you co-link below your Extra Card Zone. Decks that can spam Link Monsters have the best chance of getting all three effects, or a Soul Charge play after committing monsters to your summons. Linkuriboh, Link Spider, and Proxy Dragon are the easiest monsters to spam out and get to Tri-Gate. The Grinder Golem play with tokens can get to Tri-Gate easily as well. Tri-Gate is a great monster that every deck that can Link Summon should consider running. Its second effect is beneficial, and if you can get the third effect, you have two ways of banishing. The second Link Monster based on co-linking and easily the better one, Tri-Gate Wizard. 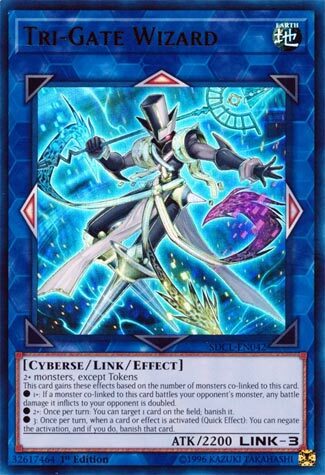 Tri-Gate Wizard is an Earth Cyberse Link-3 requiring 2+ monsters that aren’t tokens with 2200 ATK and has arrows pointing Up, Left, and Right. Good arrows for co-linking, the summoning condition is easy to fufill, the ATK is perfectly fine as is the attribute and type. Just like Binary Sorceress, Tri-Gate Wizard has effects based on the amount of times it is co-linked. 1+: When a monster you control that is co-linked to this guy battles an opponent’s monster, that battle damage they would take is doubled. 2+: Once per turn, you can target and banish a card on the field. 3: Once per turn (Quick Effect), when a card or effect is activated, you can negate that activation and banish that card. The first effect for co-linking once never really comes up that often from what I notice. The effect for just co-linking twice is outstanding. Banishing is the best form of removal and getting one banish per turn is outstanding. The final effect is great if you can fully set this up, negating effects is always considered for decks, so being able to negate and banish is amazing. Co-linking this guy 3 times might sound hard, but there are decks that can do this. Even if you can’t get 3, 2 is pretty good still. The best card in the deck, and the reason many will pick it up, this card is outstanding. So Monday we looked at something terrible, Tuesday we looked at something okay, and Wednesday we review something great! It’s like a how-to guide of creating link monsters. Oh, maybe that’s what Konami was doing this whole time. Dum, dum, dum! Tri-Gate Wizard is a near perfect monster. And I don’t mean that in a way suggesting every day should run it, but rather, this card has the balance that makes it a great addition to the game at the right time. With multiple solid effects, ease-of-summoning, and the optimal triumvirate of arrows, Tri-Gate Wizard is poised to become an Extra Deck superstar for a long time. Any addition could have pushed this monster into broken territory, whether it be allowing tokens to be material, adding a way to get plusses, or whatever. But it stopped just short of that, and I wish a lot of cards were more like that.